Ubuntu's alliterative naming has got so ridiculous now that I refuse to acknowledge its existence wherever possible. Anyway, a new version appeared the other week, so I'm now running 9.10. Newer KDE, so slightly shinier looking but a few new bugs too - my settings panel seems to lack the ability to turn the sound system off, so I get annoying little noises if I unplug the power cable. grr. 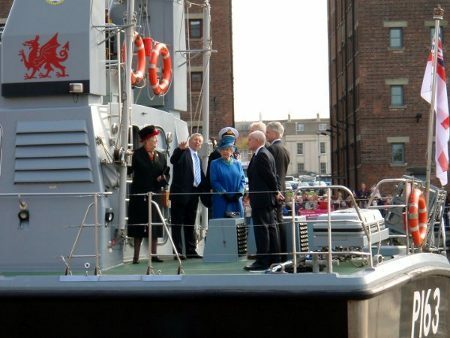 Gloucester had some vip guests a week or so ago - the Queen and the Duke of Edinburgh! Not a very exciting visit, and certainly not worth standing outside for an hour and a half waiting for.. I wandered out 10 minutes before they were due, narrowly avoided eye poking injury from some flags, and took a few pictures. Job done. Anyway, they sailed up the canal, did a very quick turn around the main Docks basin in front of the flag waving masses, then vanished again. Off to a certain distinctively shaped building in Cheltenham for the afternoon!